This paper proposes a spectral imaging technology by synchronizing a programmable light source and a high-speed monochrome camera. The light source is capable of emitting arbitrary spectrum in high speed, so that the system has the advantage of capturing spectral images without using filters. The camera and the light source are controlled by a computer in order to capture image sequence synchronously with camera and illuminant control signals. First, we describe a projector for spectrally rendering a real scene as a fundamental usage of the spectral imaging system. Second, we describe the effective applications to (1) spectral reflectance recovery and (2) tristimulus imager. The performances of the proposed algorithms to solve the applied problems are examined in experiments in detail. We demonstrate potential applicability of the proposed spectral imaging technology. F. H. Imai and R. S. Berns, “Spectral estimation using trichromatic digital camera,” in Proceedings of the International Symposium on Multispectral Imaging and Color Reproduction for Digital Archives (Society of Multispectral Imaging of Japan, 1999), pp. 42–49. S. Tominaga, T. Fukuda, and A. Kimachi, “A high-resolution imaging system for omnidirectional illuminant estimation,” J. Imaging Sci. Technol 52, 040907 (2008). S. Tominaga, “Multichannel vision system for estimating surface and illuminant functions,” J. Opt. Soc. Am. A 13, 2163–2173(1996). S. Nishi and S. Tominaga, “Calibration of a multispectral camera system using interference filters and its application,” in Proceedings of the Congress of the International Colour Association (International Colour Association, 2009), CD-ROM. N. Shimano, K. Terai, and M. Hironaga, “Recovery of spectral reflectances of objects being imaged by multispectral cameras,” J. Opt. Soc. Am. A 24, 3211–3219 (2007). S. Tominaga, “Spectral imaging by a multi-channel camera,” J. Electron. Imaging 8, 332–341 (1999). 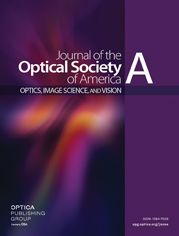 M. A. López-Álvarez, J. Hernández-Andrés, and J. Romero, “Developing an optimum computer-designed multispectral system comprising a monochrome CCD camera and a liquid-crystal tunable filter,” Appl. Opt. 47, 4381–4390 (2008). M. A. López-Álvarez, J. Hernández-Andrés, J. Romero, J. Campos, and A. Pons, “Calibrating the elements of a multispectral imaging system,” J. Imaging Sci. Technol. 53, 031102 (2009). A. Longoni, F. Zaraga, G. Langfelder, and L. Bombelli, “The transverse field detector (TFD): A novel color-sensitive CMOS device,” IEEE Electron. Device Lett. 29, 1306–1308 (2008). G. Langfelder, A. F. Longoni, and F. Zaraga, “Implementation of a multi-spectral color imaging device without color filter array,” in Proceedings of Electronic Imaging (SPIE-IS&T, 2011), p. 787606. A. L. Lin and F. Imai, “Efficient spectral imaging based on imaging systems with scene adaptation using tunable color pixels,” in Proceedings of the 19th Color Imaging Conference (Society for Imaging Science and Technology, 2011), pp. 332–338. F. Xiao, J. M. DiCarlo, P. B. Catrysse, and B. A. Wandell, “Image analysis using modulated light sources,” Proc. SPIE 4306, 22–30. J.-I. Park, M.-H. Lee, M. D. Grossberg, and S. K. Nayar, “Multispectral imaging using multiplexed illumination,” in Proceedings of IEEE International Conference on Computer Vision (IEEE, 2007), pp. 1–8. J. M. DiCarlo, F. Xiao, and B. A. Wandell, “Illuminating illumination,” in Proceedings of the 9th Color Imaging Conference(Society for Imaging Science and Technology, 2001), pp. 27–34. C. Chi, H. Yoo, and M. Ben-Ezra, “Multi-spectral imaging by optimized wide band illumination,” Int. J. Comput. Vis. 86, 140–151 (2010). S. Han, I. Sato, T. Okabe, and Y. Sato, “Fast spectral reflectance recovery using DLP projector,” in Proceedings of IEEE Asian Conference on Computer Vision (IEEE, 2010), pp. 323–335. A. Mohan, R. Raskar, and J. Tumblin, “Agile spectrum imaging: programmable wavelength modulation for cameras and projectors,” Comput. Graph. Forum 27, 709–717 (2008). A. Fong, B. Bronson, and E. Wachman, “Advanced photonic tools for hyperspectral imaging in the life sciences,” SPIE Newsroom (2008). M. Hauta-Kasari, K. Miyazawa, S. Toyooka, and J. Parkkinen, “Spectral vision system for measuring color images,” J. Opt. Soc. Am. A 16, 2352–2362 (1999). I. Farup, J. H. Wold, T. Seim, and T. Søndrol, “Generating light with a specified spectral power distribution,” Appl. Opt. 46, 2411–2422 (2007). S. Tominaga, T. Horiuchi, H. Kakinuma, and A. Kimachi, “Spectral imaging with a programmable light source,” in Proceedings of the 17th Color Imaging Conference (Society for Imaging Science and Technology, 2009), pp. 133–138. T. Horiuchi, H. Kakinuma, and S. Tominaga, “Effective illumination control for an active spectral imaging system,” in Proceedings of the 12th International Symposium on Multispectral Color Science (Society for Imaging Science and Technology, 2010), pp. 529–534. L. T. Maloney, “Evaluation of linear models of surface spectral reflectance with small numbers of parameters,” J. Opt. Soc. Am. A 3, 1673–1683 (1986). J. P. S. Parkkinen, J. Hallikainen, and T. Jaaskelainen, “Characteristic spectra of Munsell colors,” J. Opt. Soc. Am. A 6, 318–322 (1989). M. J. Vrhel, R. Gershon, and L. S. Iwan, “Measurement and analysis of object reflectance spectra,” Color Res. Appl. 19, 4–9 (1994). D. W. Epstein, “Colorimetric analysis of RCA color television system,” RCA Rev. 14, 227–258 (1953). G. Sharma, H. J. Trussell, and M. J. Vrhel, “Optimal nonnegative color scanning filters,” IEEE Trans. Image Process. 7, 129–133 (1998). D. D. Lee and H. S. Seung, “Learning the parts of objects by non-negative matrix factorization,” Nature 401, 788–791 (1999). G. Buchsbaum and O. Bloch, “Color categories revealed by non-negative matrix factorization of Munsell color spectra,” Vis. Res. 42, 559–563 (2002). J. Farrell, D. Sherman, and B. Wandell, “How to turn your scanner into a colorimeter,” in Proceedings of the Tenth International Congress on Advances in Non-Impact Printing Technologies (Society for Imaging Science and Technology, 1994), pp. 579–581. G. Langfelder, “Spectrally reconfigurable pixels for dual-color-mode imaging sensors,” Appl. Opt. 51, A91–A98 (2012). S. Tominaga, T. Horiuchi, and A. Yoshimura, “Real-time color measurement using active illuminant,” Proc. SPIE 7528, 752809 (2010). Fig. 1. Spectral imaging system. (a) Setup scene. (b) System configuration. Fig. 2. Principle of the programmable light source. Fig. 3. Spectral power distribution of the xenon lamp. Fig. 4. Spatial uniformity of projected illumination. (a) Image of illumination projected on a reference white. (b) Intensity distribution on the scan line. Fig. 5. Illuminance as a function of diameter on the lighted surface. Fig. 6. Spectral sensitivity function of the monochrome camera. Fig. 7. Spectral power distributions generated as a time sequence. (a) Time-varying mode; (b) steady-state mode. Fig. 8. Calibration systems. (a) Illuminant-camera system and (b) illuminant-spectrometer system. Fig. 9. Illuminant spectral distributions produced for CIE standard illuminants (a) A and (b) D65. Fig. 10. Appearances of a flower decoration under CIE standard illuminants (a) A and (b) D65. Fig. 11. Appearances of a flower decoration under different LED illuminants with 6500 K color temperature. (a) Spectral power distribution (SPDs) of white LED, (b) SPDs of LED by mixing RGB, (c) appearance of standard white under illuminant (a), (d) appearance of standard white under illuminant (b), (e) appearance of the flower decoration under illuminant (a), and (f) appearance of the flower decoration under illuminant (b). Fig. 12. Set of 61 basis illuminant spectra produced for 1/V(λ). Fig. 13. Basis functions of surface spectral reflectances. Fig. 14. Illuminant spectra for the modified basis functions with positive values. Fig. 15. Reflectance estimation results for all 24 patches of a Color Checker. Fig. 16. Illuminant spectra produced for obtaining the tristimulus values under (a) illuminant D65 and (b) illuminant A.